February 9th in Premium Themes, Themes for Pro Bloggers by Wordpress Jedi . Everyday that passes by, more people take time to contribute to the social communities that they are a part of. Whether it is uploading a video to YouTube, posting tweets to Twitter, or updating Facebook, people are doing it all. The idea of social blogging has been born due to that fact. People are not only sharing content on top social media sites, but they are also sharing what they are doing on those sites with their visitors on a daily basis. That way your visitors will know what communities you participate in and how they can reach out to you there. MyStream is a cool personal blogging theme that lets those new to blogging to get a fast start. The theme is designed with your social media profiles in mind. It lets you integrate your videos, pictures, and tweets into your blog easily. You can also let your visitors connect with you on Facebook, Twitter, Vimeo, and Flickr. That is accomplished through a widgetized zone with custom widgets to display your social media profiles in your sidebar. MyStream comes in 6 different color schemes. So you can get started with your theme customization process as fast as possible. 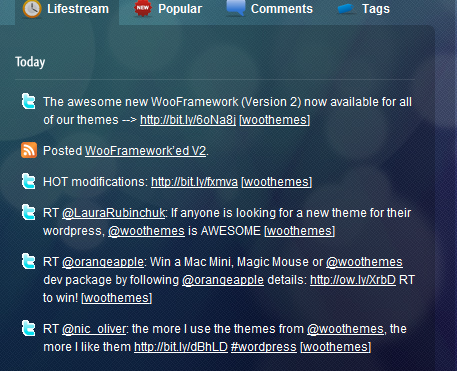 You also get 7 exclusive widgets to make changing things around and displaying information on your blog much easier. The theme is pretty flexible and SEO friendly as well. Of course, what you accomplish with this theme is up to you. If you don’t participate in social media networks out there, your theme is not going ot have much to show. Nevertheless, MyStream is a great way to get started with social blogging.